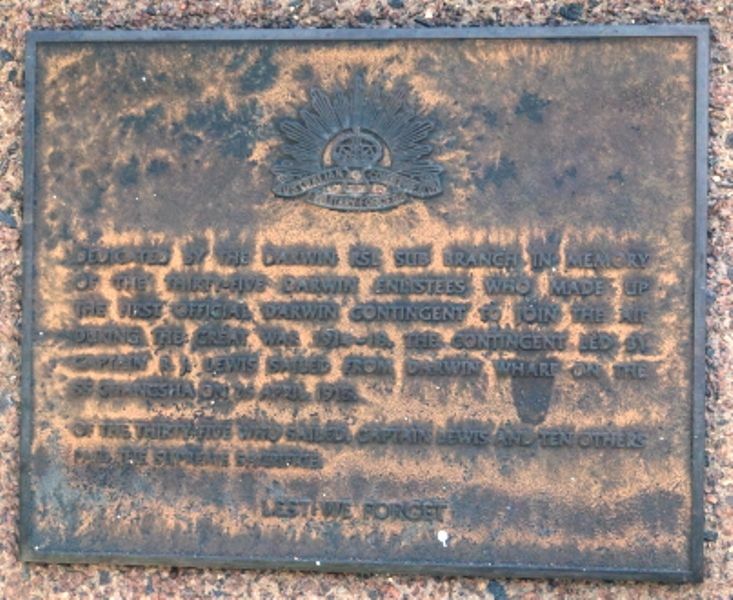 A plaque commemorates the 35 enlisted men who made up the first official Darwin Contingent during World War One. Dedicated by the Darwin RSL Sub Branch in memory of the thirty-five Darwin enlistees who made up the first official Darwin contingent to join the AIF during the Great War 1914 - 18. The contingent led by Captain R. J. Lewis sailed from Darwin Wharf on SS Changsa on 26 April 1915. Of the thirty-five who sailed, Captain Lewis and ten others paid the supreme sacrifice.